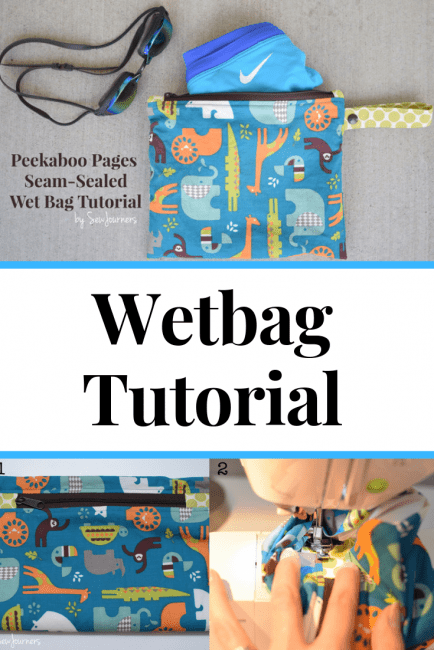 Seam Sealed Wetbag Tutorial - Peek-a-Boo Pages - Patterns, Fabric & More! Hello there! It’s Michelle again from SewJourners. 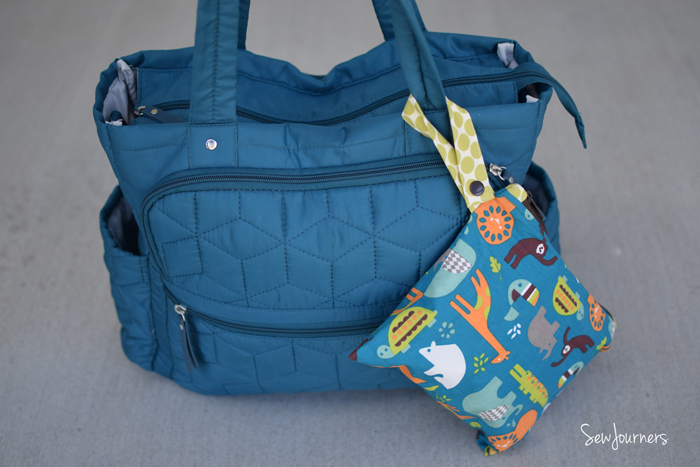 I have a free wet bag tutorial to share with you today. 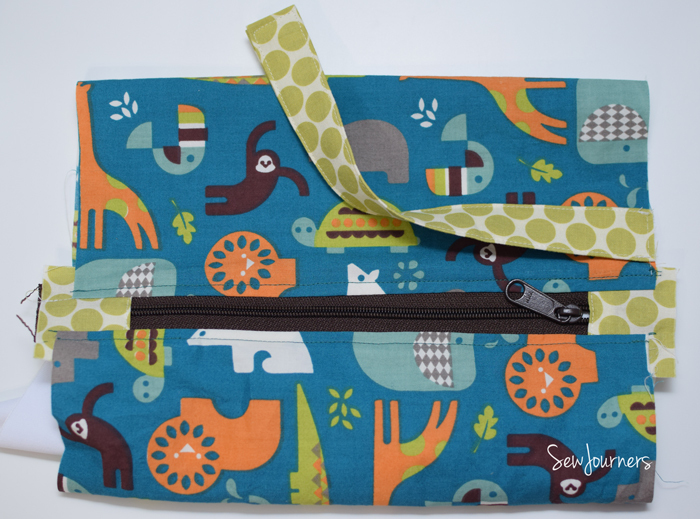 This bag doesn’t leak at the seams and has a really nice clean zipper finish. Want to make one? Wet bags have multiple purposes. They are great to have handy when swimming to store wet suits and gear. They are commonly used for cloth diapering. I keep small ones in the diaper bag and medium ones next to our extra changing table. They also make great snack bags as long as they are exclusively used for that! Make one right now, or pin for later. 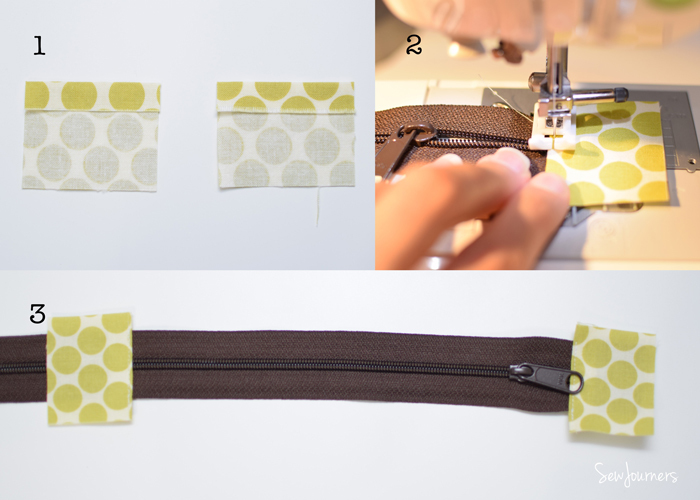 Zipper – length of zipper should be at least the width of your fabric or longer. I like the zippers with long pulls for handbags. 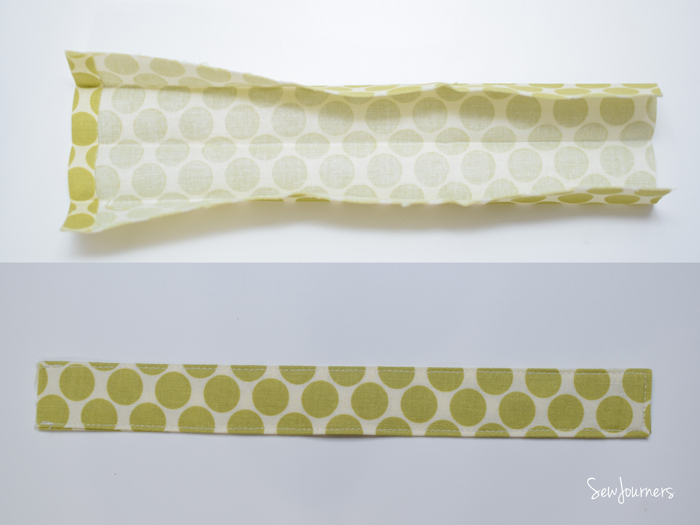 These are especially handy when cloth diapering when you may need to open the bag one handed. Take your strap and press one edge in 1/4″ to the wrong side. Then fold wrong sides together along the long edge and press. Open it up, wrong side up and fold the two long edges to meet at that center fold and press. Then fold along the initial fold so raw edges are encased and press again. Now three edegs are folds and one short edge is raw. topstitch around the entire strap. Set aside. 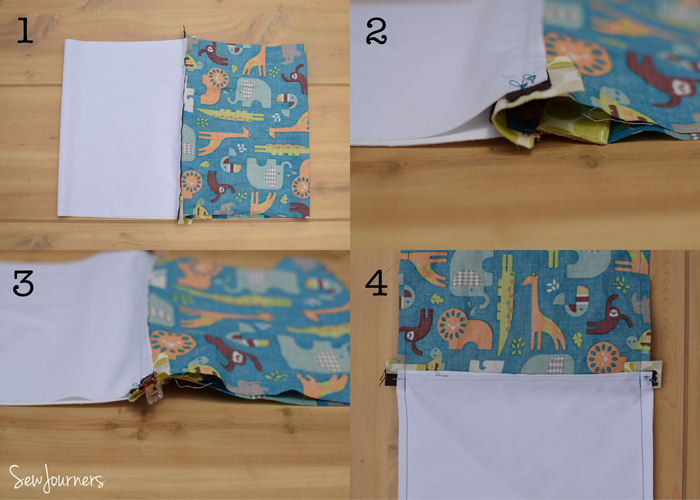 Press one side of 2″ scrap to the wrong side about 1/4″ (Fig.1) Place scraps on zipper ends with the folded edges facing each other. The distance between them should be 2″ less than width of fabric.(Fig. 3 I know my numbers are out of order!) Topstitch along the folded edge. (Fig. 2) Make sure to hand turn the wheel as you go over the zipper teeth so you don’t force it into the teeth. Adjust the needle if you meet resistance. 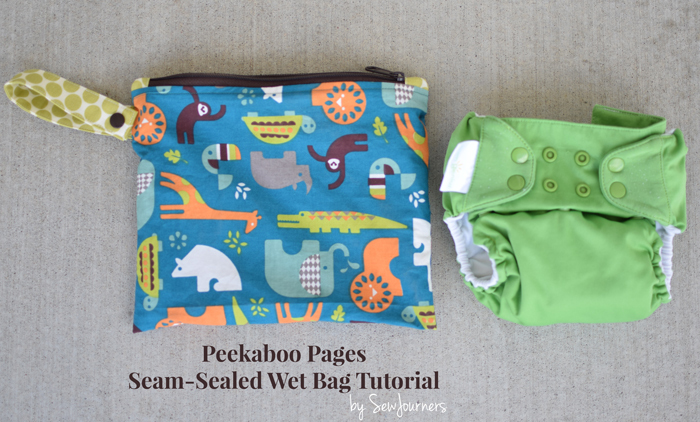 *To have a waterproof bag we will need to seal the seams. 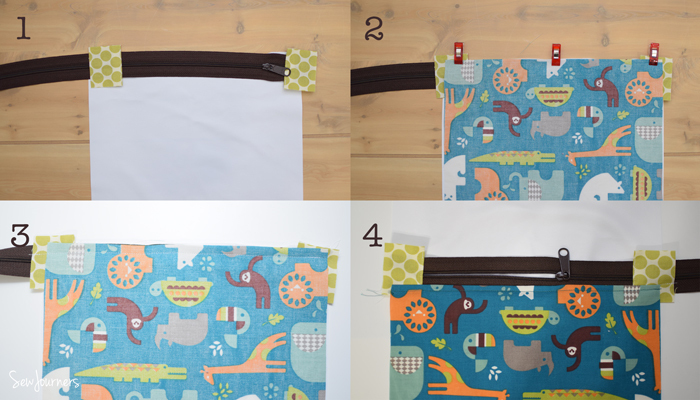 PUL has a shiny side and in this tutorial that will be referred to as the right side. Flip the main fabric right side out and top stitch just the zipper and the main. (Fig. 1) Topstitching is a little trickier on the shorter bags like I have here because you have to isolate the zipper and the main fabric. I pulled all the other layers underneath my presser foot and out of the way. (Fig 2) It seams bulky at first but it isn’t nearly as hard as it might look. 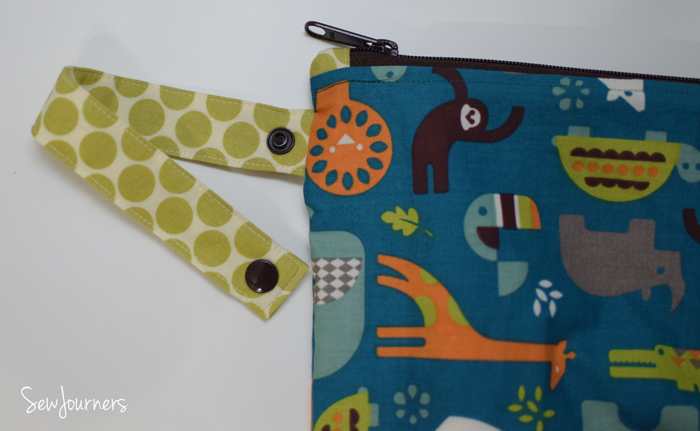 The strap will go on the side of the bag that the zipper pull is on when the zipper is shut. Place strap over main fabric RST a 1/2″ down from the zipper, raw edges aligned and baste in place only to the main fabric layer. 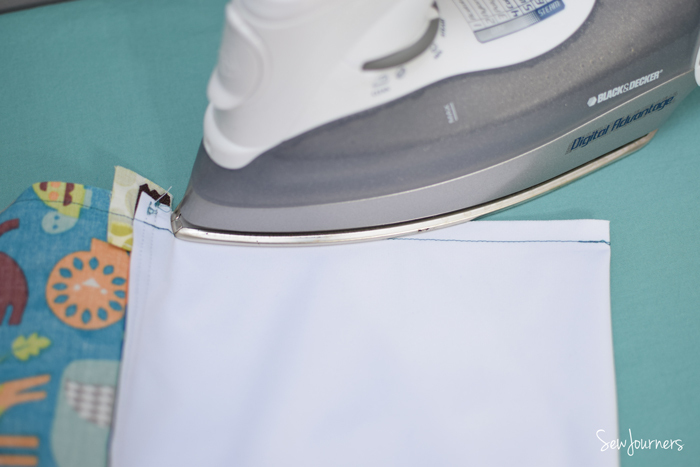 Seam Sealing Using a press cloth, press the two seams on the PUL side. (I used a press cloth but not for the picture so you could see where I am ironing. Also it didn’t hurt anything not having a press cloth) Press the seam allowance and just over the stitches to melt the fabric together, closing up the holes from stitching and creating a waterproof seal. I hold my iron over each section for about 15 seconds. Turn bag right side out. Topstitch or hand-stitch the turning opening closed. Affix snaps 1/2″ in from each end of the strap. And you’re done! Now you can make some more because these have so many uses! 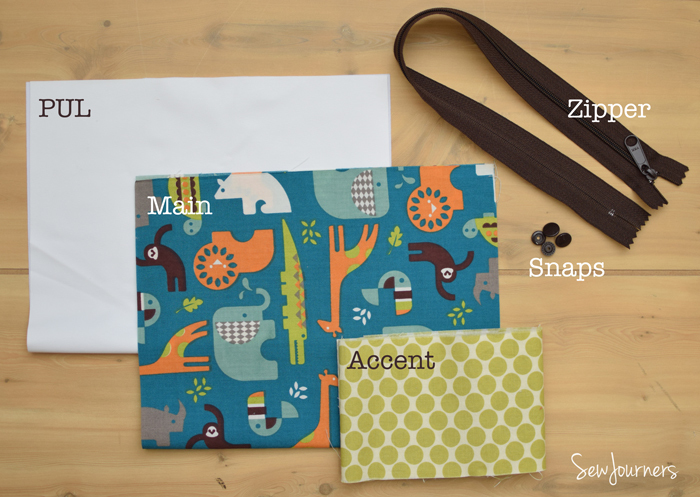 Previous Post: « Classic Oxford Sew Along Winners!